Waters and Stanton latest news and updates. The Elecraft KX3 is certainly the best QRP transceiver ever produced and is ideal for portable work. I recently considered what the antenna options were for portable work, something I do on occasions. Having carried out some test with the built-in ATU, I began to appreciate that this ATU was a bit special. It is quoted as capable of handling VSWRs as high as 10:1. I figured that an end fed wire would therefore be an option. It really does not matter about VSWR then because any feeder is going to be so short It makes no difference. By testing I found that as long as the wire was at least an eighth wave long on the lowest band, it would load on all higher bands. That meant that 16ft works from 7MHz upwards. You do need a counter poise wire of some sort and I used another eighth wave wire draped on the ground. A convenient pocket antenna is therefore two lengths of plastic coated wire, and a BNC connector with a few inches of cox cable terminated in a screw block. Just fasten each wire into each terminal . One wire lays on the ground and the other wire, the antenna, can be hung in any convenient position. Using just this 16ft wire hung up in my conservatory and running 3 Watts, it tuned all bands perfectly from 40m to 6m. I was able to work well into Eastern Europe on 40m with AA cells and 3W and could even hear my nearest 6m beacon around 50 miles away. So with a longer wire and more power, thing should b even better. Thanks to the wide range ATU, the antenna becomes a lot simpler and portable operation more fun. “We have held a station for a few years at this stunning forest location. In previous years we have used a very long wire across the trees for HF and a 10-element beam (Only 9 elements now one was lost on the first JOTA station I ran with Venture Scouts from Ramshaw Rocks in the Peak District). When we moved our JOTA location to Forest Camp I got permission to use the old climbing tower to mount the aerials and give us some height above the trees. When I was informed of a new climbing tower I asked if it would be possible to put permanent aerials up so it was available all year round. It was agreed and the staff at Forest Camp even put underground trunking in to the nearby building I would operate from. (Thanks to Dave, Guy, Nigel, Simon and others). The month before we mounted a UHF/VHF collinear on the very top of the tower. 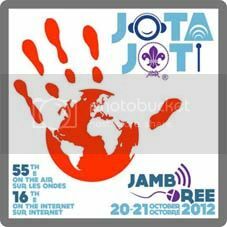 I took the decision not to put up the 2-meter beam as over the years there has been very little VHF SSB on during JOTA. Thanks go to Mike Taylor and Chris Hunt for sterling effort in getting the collinear on the very top of the tower! For HF we were lucky to have been donated a full size G5RV by amateur radio suppliers Waters & Stanton, many thanks again. This was mounted on the other side of the climbing tower and as it is mainly of wooden construction the ladder cable went down nice and straight. The ends were connected to Kevlar cord to adjacent trees via a eye hook in the trees an a counter weight. On the Friday afternoon of JOTA we connected it all up but found the old coax faulty, well it has been used for the last 20 years with out a problem! After replacing a couple of sections and re-soldiering two plugs we were on the air, with Alex from Dewa Explorer Scouts, Chester helping out. Conditions seemed to be very good with contacts made in the following countries, Spain, Israel, Rome, Austria, Siberia, Morocco, USA and even St Helena. We had a great opening to the States on 10meters, even picking up FM repeaters and with the band so clear it was almost like FM on SSB with thanks to Red, K0LUZ for his patients with Chloe one of our Scouts from Chester who was a bit quiet on the mic. Greg, G0DUB came down for a few hours to help operate the station and show the Scouts a bit of CW. I used a mobile radio and aerial for a temporary APRS station to advertise our location to the world and found other JOTA stations had done the same. Before next year we plan to replace the coax and terminate it to a junction box for easy access for an all year round activity and award more Radio communications badges. Thanks again to all the help and especially to Waters & Stanton for the G5RV.” David Mullock G7GFC. The Directors & staff of Waters & Stanton congratulate everyone at MFJ for 40 successful years of trading. MFJ is now the largest manufacturer of radio-related accessories in the world which Waters & Stanton are proud to represent in the UK. 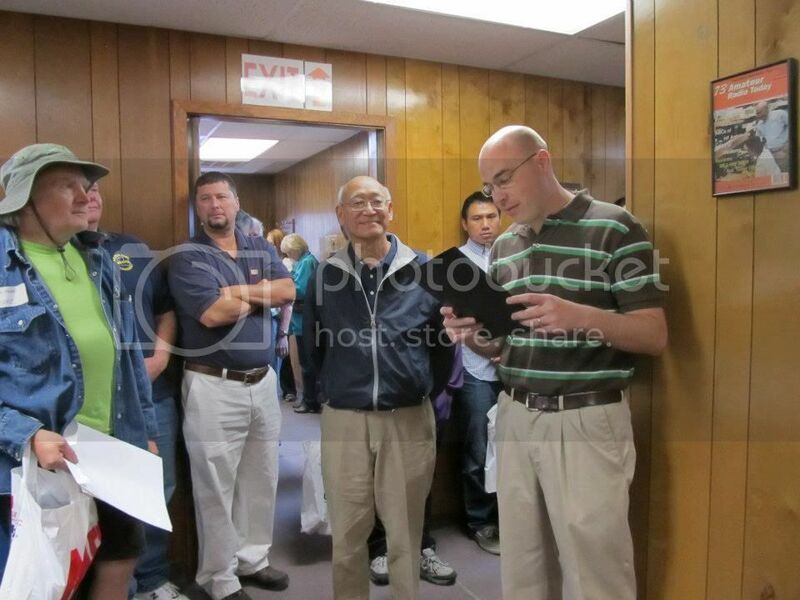 Parker Wiseman (far right), mayor of Starkville Mississippi, proclaims Saturday 6th October 2012 to be Ham Radio Day in Starkville in honour of MFJ’s 40th anniversary as Martin Jue watches on. 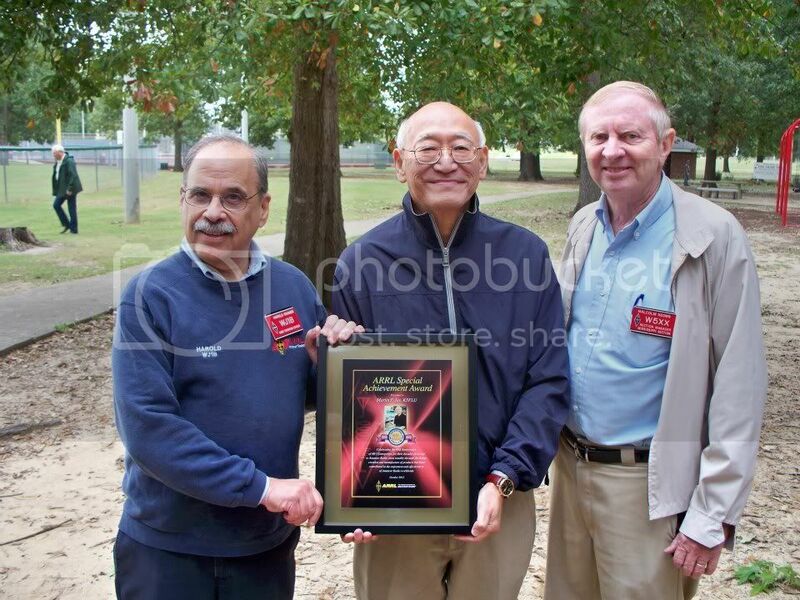 Martin Jue K5FLU (centre) is presented with the ARRL Special Award Acheivement Award at ARRL Day In The Park in honour of MFJ’s 40th Anniversary, held in McKee Park. 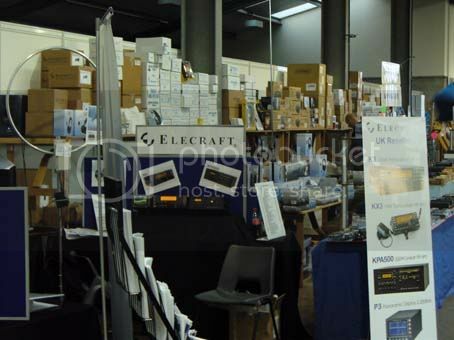 The W&S Stand at the National Hamfest in Newark, as far as the eye can see! Klaus Lohmann from Flex-Radio making his presentation. 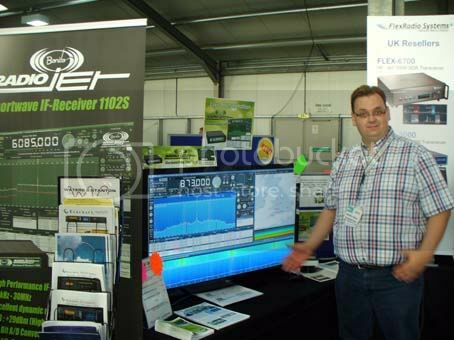 Dennis Walter of Bonito Comms was on our stand demonstrating the new RadioJet receiver. 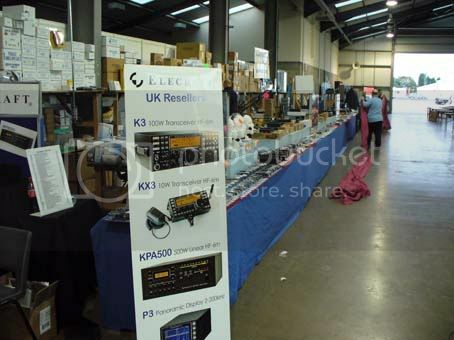 Our Elecraft display attracted alot of interest, especially as we had the KX3 with us! 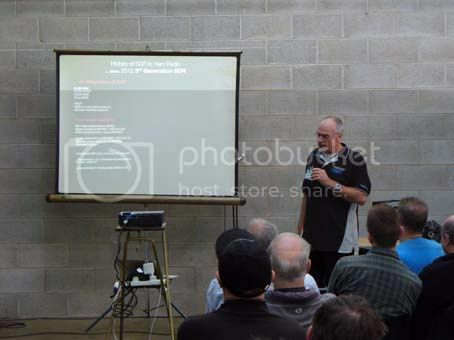 You can see how busy we were in this video (at 3m30s & 4m48s) from the National Hamfest website. We had alot of fun and hope you all did too, See you all next year! The chance to work portable is something that many hams enjoy, not only because it brings its own challenges, but because there is the chance to operate from locations that are far removed from he constricts of the average urban garden. One of the easiest of portable antennas to erect is the vertical. It is easy to carry, easy to set up and can be installed at ground level. One of our favourites is the Buddistick. This antenna is well engineered, very efficient and provides a low VSWR with the minimum of adjustment. It is essentially a centre loaded tuned vertical and the multipurpose optional clamp allows it o be installed almost anywhere. The large coil has an ingenious quick tap adjustment that provides a very fast and positive connection. In fact the system also offers a very simple antenna for home use that can be erected and taken down in minutes. The whole system fits into a small carry case that is included in the package. Check it out. The Elecraft KX3 has always been able to operate down to around 8.1v which is handy when your internal 8 x AA cells are running low. However the new firmware update available now, lets you go down even lower to 7.5v before the transceiver stops sending. This is welcome news for the many owners of this great little 10W transceiver. Firmware updates are free and can be easily installed using the supplied USB lead. There are many other additional improvements and these are all listed on the Elecraft site. All UK built KX3s have this update ready installed. At the recent Hamvention in Newark, Innovantennas were selling bottles of liquid rubber for £4.95. If you have used self amalgamating tape up until now, this substance is even bette. Just paint it around joints or cable terminations. Ideal for coating bare coax ends that occur when terminating cable to antenna terminals. It dries with a nice professional gloss and is totally weatherproof. Will last for years. Check out www.innovantennas.com for contact information and tell them we recommended it on our blog. I recently operated portable from the Highlands of Scotland. The QTH was an isolated cottage some 20 miles north of Dunoon. My equipment was a KX3 with a Buddistick and operation was on 40m and 20m. Power supply was a switch mode PSU from home and a set off AA NiMH cells. I was somewhat surprised that I was getting noise from my PSU and had to adjust the PSU tune knob to shift the noise. It was becoming irritating. I had not had this problem at home. I had som CW QSOs running ten Watts, but the noise from the PSU was spoiling some contacts. So I switched the PSU off and decided to run from AA cells. I lowered the power down to two Watts and had some good European contacts. It was at this point that I noticed the S-meter was showing zero. I was tuned to an empty channel on 40m and had zero signal! More accurately I had zero noise. Yes I was experiencing the absence of RF pollution. Using my portable XG3 signal source I was just able to move the S-meter with 1uV but with the antenna connected I got no movement on an empty channel. At home the same antenna would show a steady background noise of around S-6. No wonder my PSU didn’t cause problem at home. My PSU noise is completely masked by the high home noise floor. Extensive listening from this noise free Scottish QTH confirmed that weak DX signals could be copied with ease. A weak S-2 signal would be lost at home! Now I know my Home QTH is typical of many and I know that my S-metre is accurately calibrated. I reckon that my home QTH noise is at least 20dB above the receiver noise floor. This means that a 2.5W signal that I could hear in Scotland would need to be around 100W for me to hear it at home. So it would not be unreasonable to assume that DX reception and low signal reception is improved by a massive amount in less populated quiet areas. Of course to get the benefit in both directions, both stations need to be situated in similarly located low noise locations. No wonder that some stations are easier to work than others. It’s not necessarily our signal levels, but the other station’s noise floor. This experience lead me to recall my early SSB days of operation in the 1960s. Many of us were running 5-8 Watts from simple SSB exciters. Nets on 80m at this power level were common. What I cannot know is what the noise floor was like in those days, but as most of the common noise sources of today did not exist fifty years ago, it is reasonable to suppose that we all enjoyed great communications using modest power because of the absence of noise sources. The current trend is to run higher power because of higher and higher noise floors. The problem is that if all users of the RF spectrum raise their levels to combat the noise, the result is an increase in noise levels! You are currently browsing the Waters & Stanton Blog blog archives for October, 2012. Waters & Stanton Blog is proudly powered by WordPress | Entries (RSS) and Comments (RSS).